Located on a bluff above Geneva Lake in Wisconsin, this elegant and comfortable inn combines small-town charm and breathtaking views with fine dining and ample amenities. It doesn’t take much prodding to get Steve Eiseman talking about his favorite Midwest getaway. That’s pretty high praise from the retired Cook County Juvenile Court deputy chief probation officer who has vacationed all across Michigan, Wisconsin and Illinois. Eiseman and his family discovered Geneva Inn not long after it opened in 1990, and he’s made his pilgrimage – sometimes three times a year – to Geneva Inn for 17 years and counting. “It never loses its magic for me,” he says. Eiseman isn’t alone in his adoration for The Geneva Inn, which attracts hundreds of guests from all over northern Illinois and southern Wisconsin, virtually any time of the year. 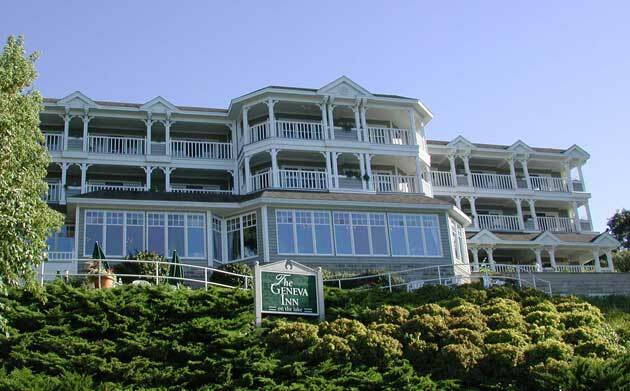 From its perch on a towering bluff overlooking spectacular Geneva Lake, The Geneva Inn is 2.5 miles from downtown Lake Geneva – close enough to stroll to the shops, boutiques and galleries, but far enough away from the hubbub to offer peace and quiet. The Inn is also close to golf courses, public beaches, horseback riding, biking, cross country or downhill skiing, and attractions such as lake cruises, sightseeing tours and fishing trips. “It’s the perfect place to go and get in touch with how pleasant life can be,” Eiseman says. 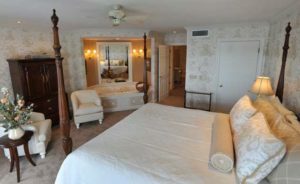 Throw in subtle touches like thick fluffy bathrobes, chocolates at bedtime, and complimentary continental breakfast, and it’s no wonder that guests, like Vivian Winters of Rock Island, are unhappy whenever their stay comes to an end. “I never want to go home,” she says. The Geneva Inn property has a long and interesting history. The area was first inhabited by Potawatomi Indians, who camped on the grounds. The first man to build a home in this area was A. H. Button, a carpenter and contractor, whose family settled in the early 1850s, on land near a part of the lake known as Buttons Bay. There, in 1883, Button helped build the Gypsy Lodge, a large summer estate where the Geneva Inn now stands. J. Hall Dow, president of Union Brass Manufacturing Co. in Chicago, paid $20,000 to build the Gypsy Lodge. He bought it from Julian Rumsey, who owned several parcels of land around the lake, including his own estate, Shadow Hill, farther north along the shore. Rumsey was the head of Rumsey Brothers & Co.; a charter member of the Chicago Board of Trade and served as its president, and the 18th mayor of Chicago, 1861-62. After her husband died in 1886, Florence May Dow sold the estate to Arthur Kaye, owner of Kaye’s Park, a popular resort once located on the present site of Northwestern Military Academy. In 1892, Kaye sold the property to the J. M. W. Jones family, who had rented it a few summers earlier. In 1920, the estate was sold to Stephan Pietrowicz, a Chicago physician. The main home later became known as Sunnycroft Lodge, a restaurant and guest house. The grounds were subdivided in the 1940s and the building was renamed The Shore Club. 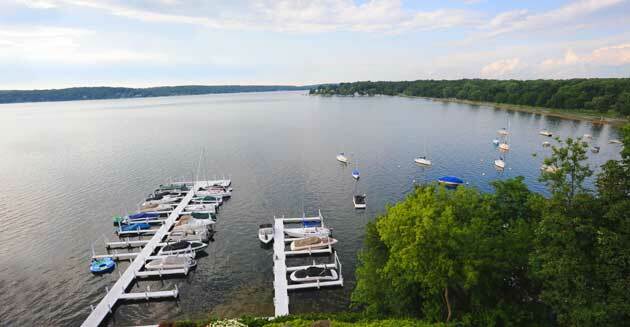 The Shore Club became a Lake Geneva landmark. There were 12 guest rooms and a front porch overlooking the lake that later became the main dining room. Many celebrations were held in the restaurant. In 1987, Jim and Cheryl Wiszowaty took over The Shore Club and renamed it Buttons Bay Inn. They sold the property in 1989 to Geneva Waterfront Inc. to make room for The Geneva Inn. The new owners, Mr. and Mrs. Clarence W. Schawk, own a global printing and packaging company, Schawk, Inc. They contemplated renovating the 105-year-old inn, but there were too many structural and building code problems. Instead, they razed the old building and constructed a new, luxurious Inn. The Schawks spent considerable time working with local architects to ensure that the new Inn would be a tribute to the history and elegance of Lake Geneva. The Schawks wanted the new Inn to evoke the ambiance of an English country house with a blend of formality and Midwest cordiality. Most of all, they wanted guests of the Inn to feel immediately at home. Guests include couples and families. They travel from southern Wisconsin, Rockford, the northwest suburbs and beyond. Summer is typically the Inn’s busy season, but some guests prefer to stay and enjoy the colors of fall or the beauty of winter and spring. Guests can choose to stay in either a “Landview” or a “Lakeview” room, which is popular for guests who want the stunning view of the lake and the opportunity to see the magnificent sunset from their own private balcony. All lakeview rooms and suites recently received a complete makeover from floor to ceiling. Improved lighting, new flat-screen televisions, new carpeting, wall coverings and draperies were installed. There’s an exercise room, lakeside patio and a private pier. A 21-mile shore path circling Geneva Lake is right outside the door. There are two meeting rooms – the smaller Bayberry, located near the front entrance, for corporate meetings of up to 40 people, and the Hawthorne, accommodating 80 for corporate events and wedding receptions. Wedding ceremonies are sometimes held in the upstairs atrium or on the outdoor patio. The Grandview offers American Continental cuisine and a diverse menu that changes with the seasons – seafood, pastas, steaks, salads and special wine dinners, created by Executive Chef Joe Lazansky and staff. There’s live music every Friday and Saturday evening, as well as Sunday brunch. That view. It’s what captures the heart of every guest who visits The Geneva Inn. Jeff Winters is one of those people. The middle school social studies teacher from Rock Island, Ill., has stayed at The Geneva Inn with his family for the past 16 years. Their favorite time to visit is over Thanksgiving, when they can soak in both fall color and Christmas décor. This entry was posted on Friday, October 14th, 2011 at 11:59 am	and is filed under Recreation & Destinations. You can follow any responses to this entry through the RSS 2.0 feed. Both comments and pings are currently closed.